Hooray for a book that is truly original! 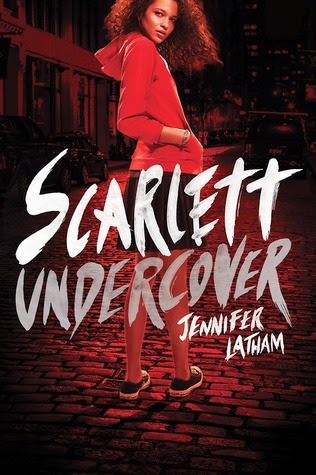 I loved Jennifer Latham's debut novel, Scarlett Undercover, and hope that YA readers will embrace its smart, funny, and independent heroine. Scarlett graduated high school two years early and works as a detective, solving all the crimes except the one that she wants most: that of her father's murder. While his death and her mother's death from cancer led to her sister becoming a more devote Muslim, it made Scarlett wary and distrustful. When a young client asks her to help learn why her brother is acting so weird, the case becomes far more serious and may lead her to answers about her family. Scarlett is an awesome protagonist - sarcastic and aspirational, but still vulnerable. Latham struck a great balance with a Muslim American heroine. I learned about Islam, but also didn't feel like the book was didactic or shoving diversity at the readers. Her voice was unique; it felt like an old gumshoe updated to sound like a teenage girl. Somehow, it worked. It's too mature for my fifth graders, but I will be buying a copy for the middle school library, and actively recommending it to the teenagers I know.